We here at homify 360° feel that everybody is in need of a break. A relaxing breather that allows us to blow off some steam. And what better way to recharge the batteries than by checking into a luxurious tropical villa? 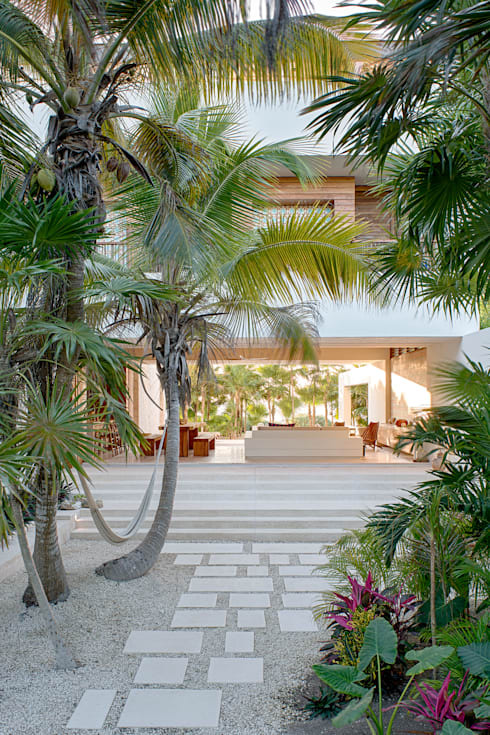 American team Specht Architects have generously allowed us to use one of their glamorous creations located on a white sandy beach in Tulum, Mexico. This villa was designed according to two premises: to be totally self-sufficient and to ensure that the house, and its residents, were fabulously immersed in the surrounding natural paradise. Not only does our retreat for today succeed in these qualities, but it presents absolute dream house potential as well, regardless of whether you would call yourself a beach lover or not. So, sit back with a calming mind-set, and enjoy the tour! What good is a relaxing break if it doesn't immediately get to the main element of luxury—which, in this case, is a fabulous pool. Surrounded by a spacious terrace in a gleaming coat of white (superb for reflecting that Mexican sun during tanning season), this poolside dream is just the remedy for the tired mind and body. But equally impressive is that villa. Flaunting its modern architecture with cubic designs and clear-cut lines quite strikingly, it also pulls powerful punches in terms of sustainability. With solar panels on the roof and a rainwater tank, this tropical villa is very much energy efficient. From one side of the house to the other… a palm-lined path that leads to the generous opening into the living room, allowing us to see straight through the house. 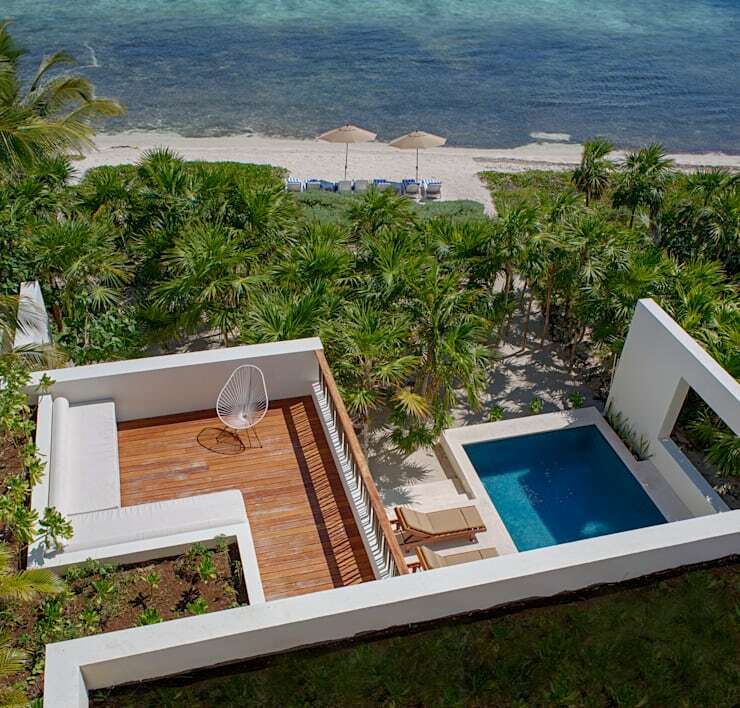 The intention here was to separate the house slightly from the beach for a bit of privacy, yet also makes the residents feel that they are still surrounded by paradise. Whether they lead to the beach or not, we have some delightful garden ideas here on homify. The social area of the house is the ground floor, made up by the living room, dining area, and kitchen. These three areas flow effortlessly into each other, making for an open and welcoming environment all around. We love how both sides of the house have gigantic sliding doors that fully open up, making us appreciate that crisp sea breeze, even though we are inside. Hands up everybody who already feels completely relaxed! 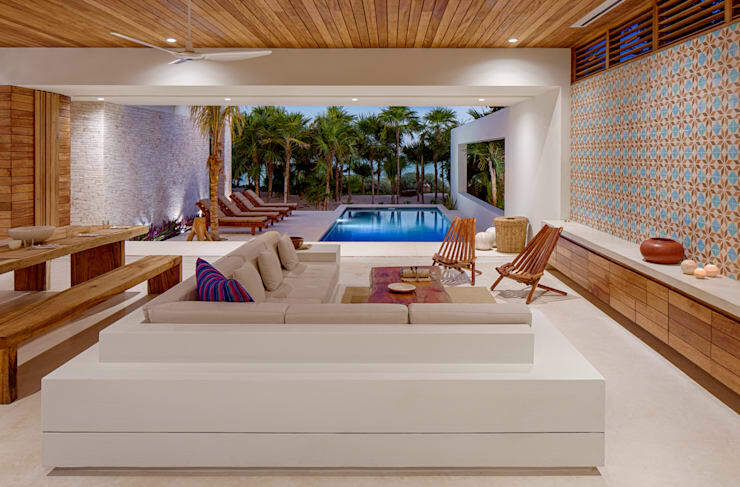 Apart from that glorious beach vibe, wood also plays a starring role in this magical villa. Just notice that solid wooden dining table and matching benches, dishing up the ideal spot for quality meals and happy socialising. A few steps back take us into the kitchen, where a decent portion of concrete joins the wooden coatings. We just love how the warm honey-toned wood offsets impeccably with the cool white concrete, and how the stainless steel appliances sparkle in-between. Upstairs is where the four bedrooms are located, ensuring they receive optimum views of those playful ocean waves across the road. 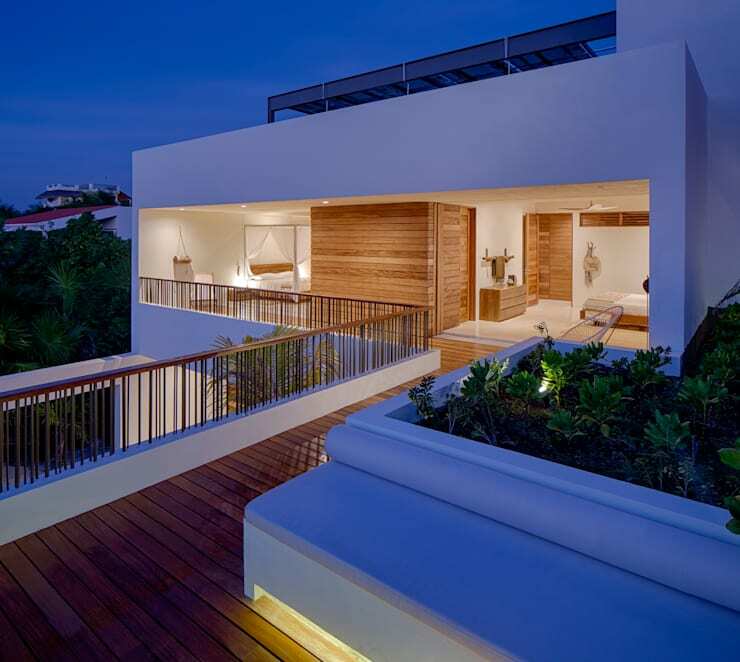 And as is the case on the ground floor, each bedroom also opens up onto the surrounding exterior, promoting a free-flowing ventilation of cool ocean wind. A good dose of plants have been inserted onto the open balcony, mimicking the lush gardens downstairs and adding a nature-filled scent to our stargazing. And that ever-present wood still does a remarkable job of keeping the charisma level of the villa in terrific shape. All four bedrooms have adjoining bathrooms, and two of the bedrooms boast magnificent sea views with direct access to a private balcony. 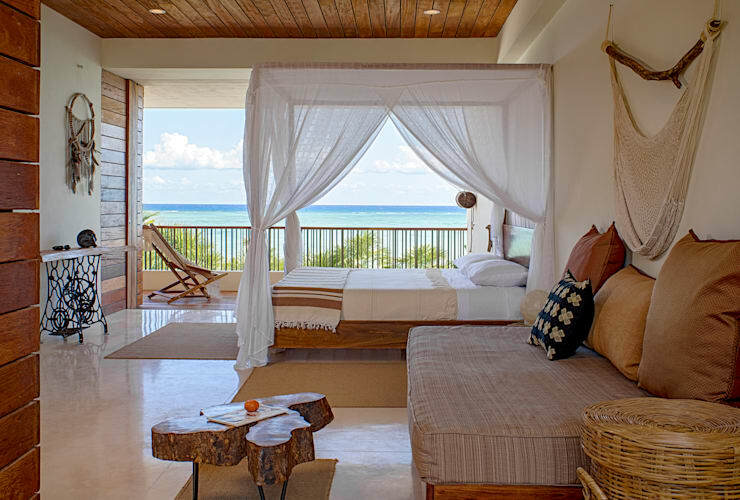 The bedrooms are decorated in a stylish mix of modern design, rustic elements, colonial atmosphere, and a light, tropical ambience. Quite a collection that will, no doubt, ensure peaceful and elegant slumbering. 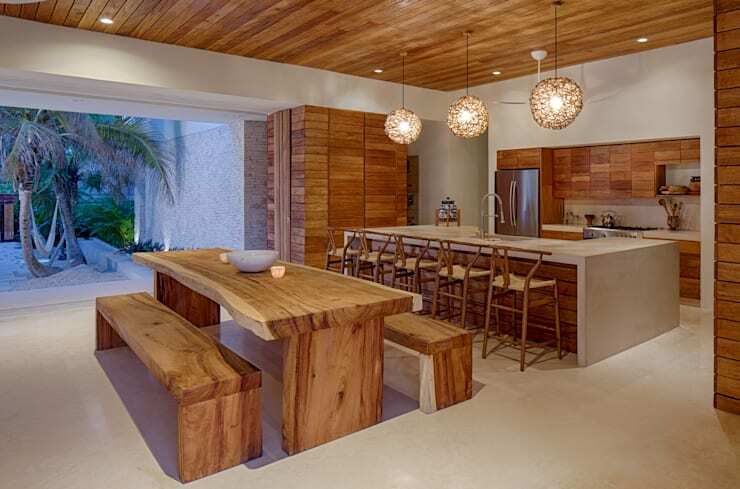 Although, as in the kitchen, the warm wood here contrasts delightfully with the white concrete, they are both beaten by that majestic view of the tranquil Caribbean Sea. Before we depart from paradise, we thought: why not one last look to tie us over until our next trip to an exotic location? So, feast your eyes on this majestic beauty: a stunning combination of modern design, tropical plants, and an idyllic ocean setting. For those who feel they need another dose of tropical paradise, don't miss the: Dream Villa by the Ocean.